The Venice Biennale for Art has been in existence since 1895, when it opened with one main pavilion in the area known today as the Giardini. Since 1980, when the large space of the Arsenale was added, the Biennale has been attracting close to 500,000 visitors every two years (in alternate years the Venice Biennale for Architecture is held). The Biennale has become a brand, and has served as a model for countless other Biennales around the world, all of whom need accreditation to bear the Biennale name. Besides the Giardini and the Arsenale, the entire city of Venice turns itself into a large museum devoted to contemporary art from all over the world. Israel’s pavilion, designed in the 1950s by Ze’ev Rechter in the International Style (he designed several buildings in Tel Aviv in the same style), is devoted to works by Gal Weinstein. However, at least four other Israeli artists have or had exhibits in Venice during the current Biennale—Beverly Barkat, wife of Jerusalem Mayor Nir Barkat (Palazzo Grimani, 13 May 2017 — 26 Nov 2017), Avner Sher (Palazzo Bembo 13 May-26 November), Ariela Wertheimer (Palazzo Moro, 13 May – 31 October) and Hadassa Goldvicht, whose work, I Am Yours And My Dreams Are Yours / The House Of Life, is currently on view at the Palazzo Querini Stampalia (9 May 2017 — 26 Nov 2017), a cooperative project of Meislin Projects in New York and the Israel Museum. 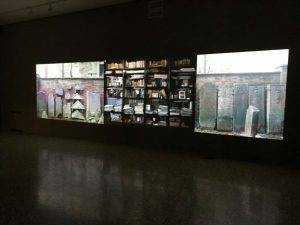 Of all aforementioned Israeli exhibits, only Goldvicht’s work actually relates to its location—Venice, as a home to a famous Jewish community and the site of the eponymous “Ghetto.” This makes it unique among all of the Biennale exhibits. Venice’s Jewish community became famous not only because of Shakespeare’s Merchant of Venice, but because in 1516 it became the site of the first closed quarter to house Jews, named most likely after the foundry in the area where the Jews were cloistered, the Geto. From this time forth, the word “ghetto’ became synonymous for an area in which Jewish (and in more recent years, other) communities were forced to live. The ghetto was locked at night, and closed completely on Sundays. So just as the Jews required special permission as to where to live, they also required special permission as to where they buried their dead. In fact, Jewish presence in Venice dates at least from 1386, when permission for burial was first granted. The original cemetery was in use until the end of the 18th c, when a newer cemetery (still in use today) was opened nearby. The Jewish community of Venice numbered in the thousands at its height; today the numbers are dwindling, and only a few hundred members remain. About 200 members of the then 1200 member community of Venetian Jewry were murdered in the Holocaust. That, intermarriage, and Venice’s general decline, influenced demographics. 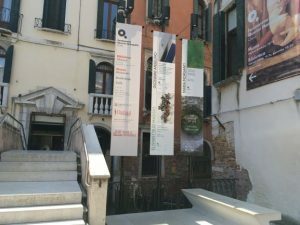 Nevertheless, the community initiated a rich program to commemorate the 500th anniversary of the founding of the Ghetto last year, including an exhibit in the Palazzo Ducale and an original production of The Merchant of Venice outdoors in the Ghetto itself, a first. The community supports a kosher restaurant and guest house, and holds services in its synagogues. Goldvicht received a grant from the community to create a work of art about them. After sitting with many of the remaining members of this dwindling community, she met Aldo Izzo, the keeper of the cemetery. Izzo, now in his eighties, is a distinguished figure who served in the merchant marine before his retirement. Since then, he has been the custodian of the cemetery, where he officiates at funerals and memorial services, records all the deaths in the community, and, as part of maintaining the cemetery, has curated many of the old headstones, which were separated from the graves they marked over the centuries. 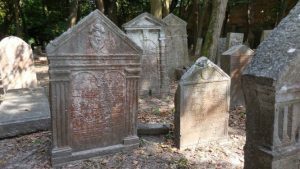 There are many stones without bodies in the cemetery because of the various renovations and building projects carried out over the years. Many stones were saved, but the graves themselves (generally the very old ones) were not found. Just one example — in the eighteenth century, land next to the cemetery was expropriated for a shooting range. The Lido, the island on which the cemetery is located, became a fashionable beach resort at the end of the 19th century, and often, in the course of the excavation of a new road or building, tombstones would be found and moved to the cemetery. The cemetery has been painstakingly documented in a monumental work—anyone who traces their ancestry to Venice should consult it. Goldvicht’s installation is not about the specific individuals buried in the cemetery, nor the beautiful epitaphs lovingly composed, although there are many prominent figures in Jewish history to be “visited” there. This work is about memory and its preservation, the different roles it can have in our lives as well as about the keeper of memory, and his role. Located in the Palazzo Stampalia Quirinale, which has a collection of Baroque era paintings as well as another art installation, Goldvicht’s installation consists of photographs and films of the cemetery, of Izzo and his house, and lightboxes of the careful “log” that he has been compiling over the years. Goldvicht’s installation, like many of her other works, includes direct engagement on her part—either in the performance of the work (as in her film Jonah, recently acquired by the Israel Museum), or with the subjects of her work, as in Lullaby, a work she did in which she asked a variety of people employed at the Museum, from the director at the time, James Snyder, to the maintenance workers, to sing a lullaby that was sung to them as children. This latter work (also at the Israel Museum) has had a huge impact not only on visitors to the museum, but on the employees themselves, who had become themselves part of an exhibit at the place where they work daily— blurring the boundaries between workers, visitors, artists, and works of art, and at the same time, creating a coherent whole, greater than, but also including, the sum of its parts. In the Venetian work Goldvicht was greatly engaged and influenced by Aldo Izzo, who by “showing her how to die, showed her how to live.” The work is a meditative and lyrical look at life, through the prism of the final resting place of a once-glorious Jewish community in the once-glorious city of Venice. In short, it is highly recommended. If you can’t make it to Venice: two works by Goldvicht, “My Soul as a Rattle,” a video, and “Little Red Bag,” are currently on display at the HUC Skirball Museum as part of the Jerusalem Biennale in the exhibit “Skyline Artifacts,” curated by Sandra Valabregue ; another is part of the exhibit, “Thou Shalt Not,” at Museum on the Seam in the Jerusalem.